The Datamax-O-Neil MP Compact4 Mark II is a powerful response to desktop thermal printing requirements, and ideal for on-demand printing especially where space is limited. The printer is ideal at the front desk of a hospital or in the box office of a movie theatre. Able to deliver continuous operation, the MP Compact4 Mark II is the printer of choice whenever ease of use, reliability and high performance are a must. The MP Compact4 Mark II features direct thermal printing with a media width of up to 4.5", and prints at 5" per second at either 200 or 300 dpi. Interfaces include serial, USB and Ethernet. 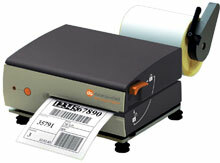 The Datamax-O'Neil XA3-00-08000000 is also known as ONE-MP200DLPWI	or XA30008000000	.